Having a vegetarian barbecue or hosting some vegans at your cookout? Don't simply reach for the veggie burgers; although a standby at vegetarian cookouts, you don't need to stop there. There are so many great vegetarian and vegan options that you can throw on the grill other than a patty. From tofu to cheese to fruit, there are plenty of ideas for what to grill for a fantastic meatless cookout—beyond just veggie burgers. 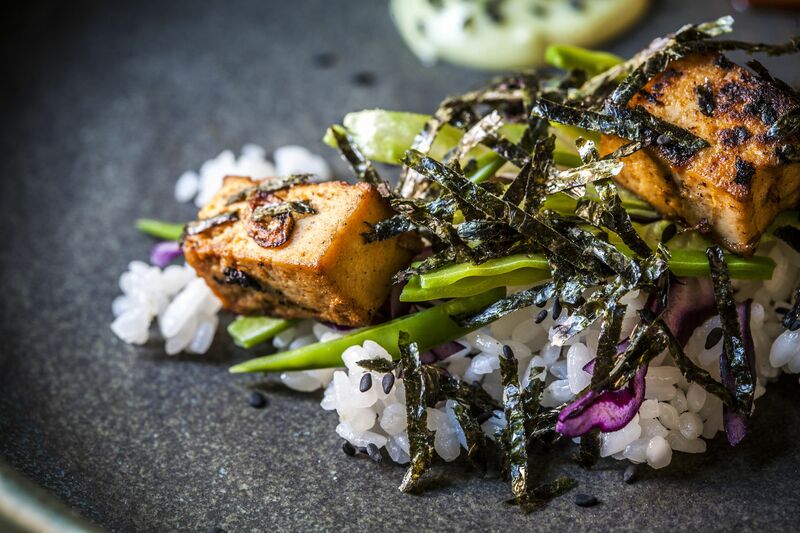 If your only experience with tofu is when it is cut into cubes and floating in miso soup, you may be surprised to learn how versatile it is—especially on the grill at a vegetarian barbecue! It'll absorb any flavor you put on it, which means that you can make Asian style tofu, saucy Indian tofu, Italian seasoned tofu, ​Mexican flavored tofu, or even a chimichurri tofu, and all with that nice smoky grilled flavor. Not looking to get fancy? Chop up some well-pressed tofu, marinate it in Italian salad dressing, and thread the cubes onto your vegetable kababs. When it comes to meatless vegetarian grilling, mushrooms are your friends—your best friends, in fact! Use portabellas as veggie burger patties, turn them into a vegan grilled sandwich, or just slice them right up and enjoy. Or stuff mushrooms with cheese and herbs and grill until warm and melted. Since meat eaters and vegetarians alike can enjoy, there's no excuse not to have a veggie side dish at your grill party. An easy and pretty recipe is for veggie skewers. Vegetable skewers can be as simple as whatever veggies you have on hand—like bell peppers, mushrooms, cherry tomatoes, and onion chunks—marinated in store-bought salad dressing (or even olive oil and balsamic vinegar), and plopped on the grill. Sprinkle a little salt and pepper, and done. Or, you can get a little creative with your skewers like sliding sweet pineapple in between all those savory veggies. But kababs aren't the only way to grill vegetables. 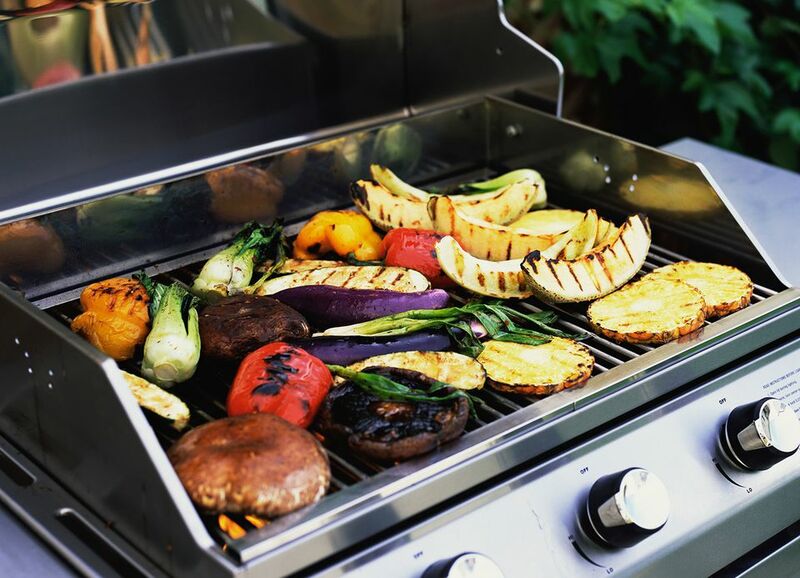 There are many interesting and delicious recipes for vegetable dishes on the grill, including grilled sunchokes and balsamic beets. And grilling a few different vegetables and combining in a salad—like in grilled vegetable quinoa pilaf and grilled Mediterranean vegetable salad—is a great way to turn a few vegetables into a substantial dish. You may be thinking, "Grill cheese? Won't it make a melted mess?" Actually, there are some cheeses out there that seem to be made for the grill. Halloumi cheese, for example, is incredibly delicious when lightly grilled, as is Indian paneer cheese. Both of these cheeses won't melt, and just get better when heated. Make more than you think you need because everybody is going to want some! You can also place cubes of paneer on kababs and glaze with chili sauce. And if you freeze thick slices of provolone first, they will soften nicely on the grill, perfect on pieces of toasted French bread. Seitan is made from wheat and often used as a meat substitute. It isn't for everyone as it's heavy, chewy, and meaty, but that just makes it perfect for people looking for a good meat replacement. And seitan is wonderful on the grill, especially in place of beef or chicken. It's also great simply placed on a skewer and brushed with your favorite barbecue sauce. Veggie packets are a quick and easy side dish to serve alongside whatever your grilled main dish might be—vegetarian or not. Wrapping veggies in aluminum foil cooks them up nice and tender and works well in place of a grill basket, as well as for veggies that are difficult to skewer. Try tossing snap peas, edamame, mushrooms, and/or onions (which become sweet and smoky) in a double-lined packet made of foil. A little olive oil, salt, and pepper is all you need, but you can also add a bit of vegan margarine and hot sauce if you prefer. Just drizzle it on the veggies, wrap up the pouch, and place it on a hot grill. You can also add some Asian flavors to water chestnuts and bell peppers with soy sauce and chili oil, or treat your guests to packet-grilled Jerusalem sunchokes. Pineapple is usually the star fruit of the grill, but peaches, apples, figs, and even melon (actually, almost fruit) can be grilled with delicious results. For a simple and perfect outdoor summer dessert, grill up some fruit and place it on top of a bit of vanilla ice cream (or non-dairy vegan ice cream for your vegan friends). You can also grill bananas that have been sliced and coated with brown sugar and cinnamon; the fruit becomes tender and caramelized and is a decadent (but healthy!) ice cream topping. If you look at veggie burgers and think, "I can do better than that," there are several gourmet vegetarian grilled entrees that will make all those steak-eaters more than jealous. You'll probably want to double or even triple-up the vegetarian barbecue recipes since everyone will want a taste. Grilled stuffed green peppers are filled with chopped vegetables, herbs, spices, baked beans, and cheese and then grilled until the insides become warm and melted. Or try cheese-stuffed grilled tomatoes flavored with blue and Parmesan cheeses. Both recipes are delicious, and just enough to satisfy any vegetarian. Pop open a box of store-bought veggie burgers, and your meat-free friends will probably be just fine (mainly because you had the forethought). But if you want to truly impress and satisfy them, try your hand at a grillable homemade veggie patty recipe. A grilled portabella patty is usually a crowd pleaser, as are burgers made with beans, like easy vegan black bean burgers, hearty black bean burgers with cornmeal, and mushroom and bean burgers. If you like working with textured vegetable protein, a TVP veggie burger may be the one for you. Mixed with onion, ketchup, herbs, and spices, this veggie burger is packed with flavor.